So, we were minding our own business today, cleaning out the shed when we notice something up in the eaves. Bryan gets the step stool and starts looking around. He pulls out mail, postmarked at different times during fall 2000. He looked in the other eaves and pulled out even more! Somebody must have been trying to hide something, because mail just does NOT get *lost* up there! Bryan kept hoping he would pull out some money but no such luck..LOL! 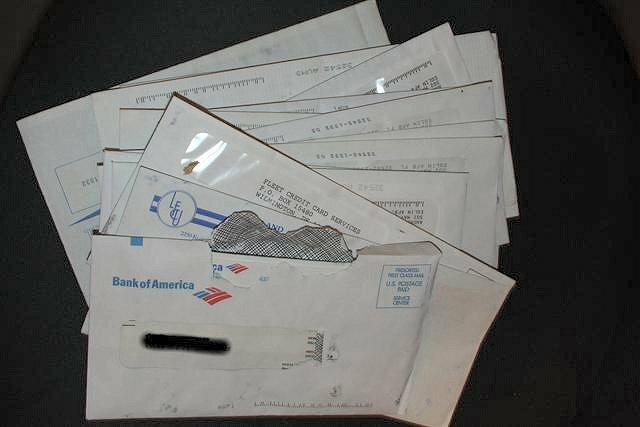 There are probably 20-25 pieces of mail, all of them from banks or credit cards and 2 were even from the gov’t travel card. Bet you can only guess what that means (looks like someone was in a little bit of financial hot water). They are old but technically if we throw them away, it is a federal offense so Bryan is taking them to OSI and letting them do with them as they please. I thought it was just plain weird though! Wonder what other secrets are lurking in this house?!?! That is weird — what a place to hide them too! Found an old wooden box, looked like a keepsake box, with ornate engraving on the top and a small latch on front in it was, a baggie containing an unknown ‘herb’ and some condoms, and other assorted ‘interesting’ items. Had to have been teenagers, I suspect, other wise, why would it all be hidden, right?? when we lived in housing there, I found some goodies, too up there in the rafters of the storage shed! Imagine my surprise when I found some dirty magazines! I thought my hubby was trying to hide them at first! But they were a few years old at least! Funny!! Wow! that is a little odd, maybe someone had some charges they didn’t want the wife to see?? ?